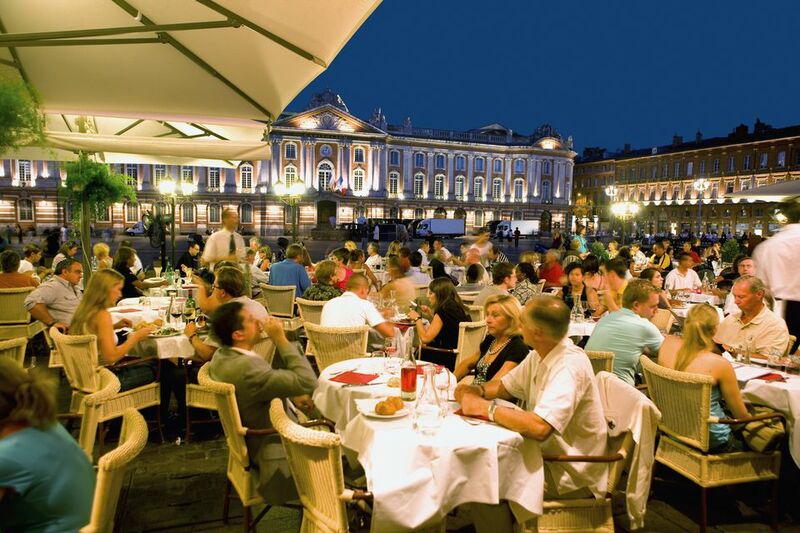 Read more about Paris and Toulouse. Toulouse is in the Tarn region in Languedoc-Roussillon. It's a wonderful city, which many visitors strangely ignore, possibly as it's known as an aviation centre which today is home to Aerospatiale, which produces the Airbus and the Ariane space rocket. Toulouse is where the Canal du Midi joins the Garonne river. If you fancy a truly relaxing holiday, I recommend taking a canal barge trip with European Waterways through Gascony on Rosa. Direct TGV trains with no changes to Toulouse station leave from Gare Montparnasse in Paris (17 Boulevard de Vaugirard, Paris, 14th arrondissement) all through the day. The journey takes from 5hrs 20 mins. Ligne 13 - Saint Denis/Universite et Gabriel Peri-Asnieres Gennevillers to Chatillon-Montrouge. Direct Intercity express trains with no changes to Toulouse station leave from Gare d'Austerlitz, 55 quai d'Austerlitz, Paris 13. You can also take the TGV trains to Toulouse station via Paris Gare de Lyon (20 boulevard Diderot, Paris 12) all through the day. But these involve changes in Montpellier or Bordeaux. Paris to Toulouse station in 3hrs 21 mins. From Lille (which connects with Eurostar) the easiest and fastest route is directly to Lyon where you change trains (but not stations) for a direct train to Toulouse, taking around 7 hours. From Charles de Gaulle Airport the easiest and fastest route is also via Lyon taking around 6 hrs 15 mins. Popular direct connections include Lyon, and Marseille. Toulouse has good high-speed links (non TGV) with major French cities. See the major TER services on the TER website. Toulouse station is on boulevard Pierre Semard in the city center. Toulouse Blagnac Airport is 8 km (5 miles) northwest of the city. Shuttle buses run regularly from the Airport to central Toulouse taking 20 minutes. They leave the airport every 20 minutes from outside the Arrivals area, by door C, from 7.35am to 0.15am. Destinations As Toulouse is the home of Airbus and a major industrial city, connections are excellent. Destinations include all the major French cities like Paris, Lille, Lyon, Nantes, Strasbourg, Nice and more. International destinations include most European countries and Canada. The distance from Paris to Avignon is around 680 kms (423 miles), and the journey takes around six hours 20 minutes depending on your speed. There are tolls on the Autoroutes. Compare car rental rates in Europe.